Over recent years I have spent many hours exploring the Stonehenge landscape and the ever present hares are an integral element of that region of Salisbury Plain. They are recorded as being coursed on the Downs around Amesbury in the late 16th century and in the early 19th century, and the coursing was recorded as ‘excellent.’ Amesbury Coursing Club was formed in 1822, at which time the owner of the land allowed hares to be preserved on the downland near Stonehenge. Elsewhere in the parish was also regularly used for coursing. The Altcar (Lancs) Club held a seven day meet at Amesbury in 1864 and the South of England Club used to meet at Stonehenge. Immediately southeast of Stonehenge is Coneybury Hill, where Coneybury Henge once stood. ‘Coney’ is a Middle English word deriving from Old French meaning ‘rabbits’. Hares and rabbits clearly have a long association with the Stonehenge landscape. 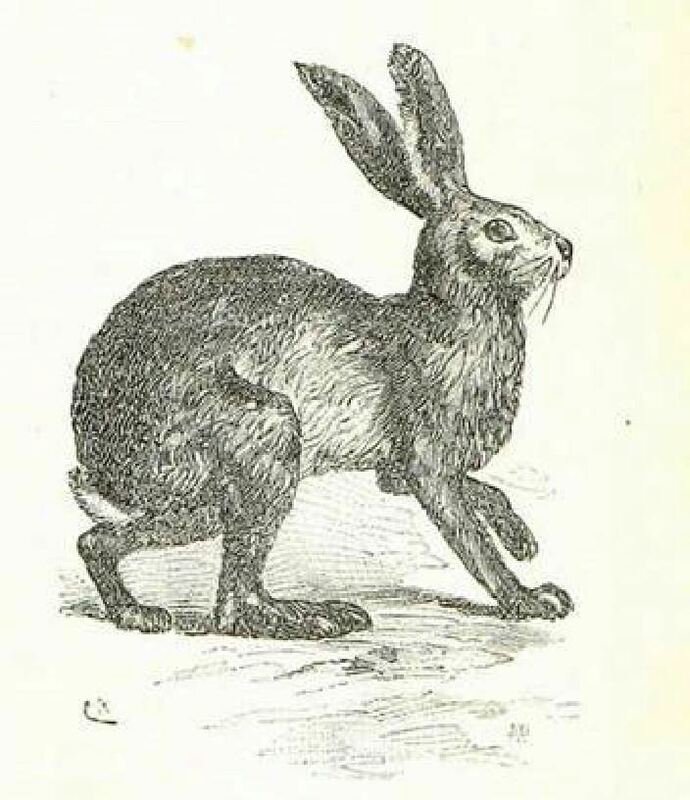 ‘The Names of the Hare’ is a poem written in the late thirteenth century, originally in Middle English, that is attributed to a Shropshire family on the Welsh borders. The poem is said to be a ritual to be recited by a hunter on his first encounter with a hare, and the seventy seven different names given to the hare in the poem were supposed, on recital, to deliver it to the hunter’s power. to speak the praises of the hare. Then the man will better fare. 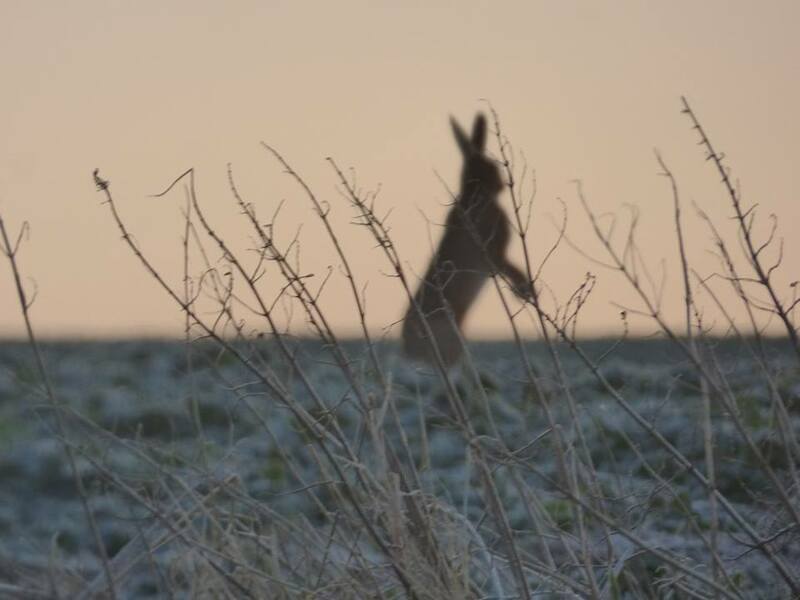 then the hare’s strength has been laid. but only if you’re skilful too. And now, Sir Hare, good-day to you. in either onion broth or bread. Source of the text – The Rattle Bag, edited by Seamus Heaney and Ted Hughes. London: Faber and Faber, 1982, pp. 305-306. And I sall goe in the Divellis nam. ‘Hare, hare, God send thee care. 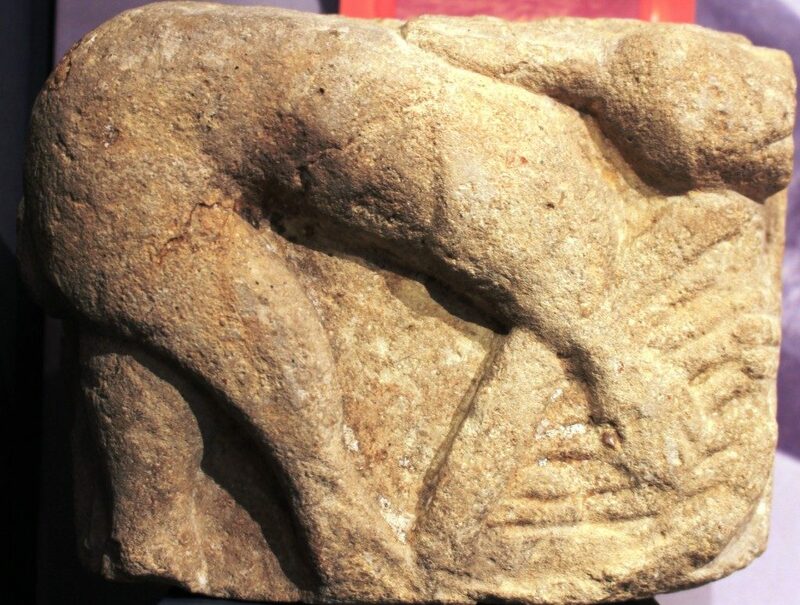 Below is a photograph I took recently of a 12th century carved stone depicting a hare playing a harp, originally from a cottage in Powerstock, Dorset and believed to have come from the site of Wytherston Church. It is on display at Dorset County Museum. 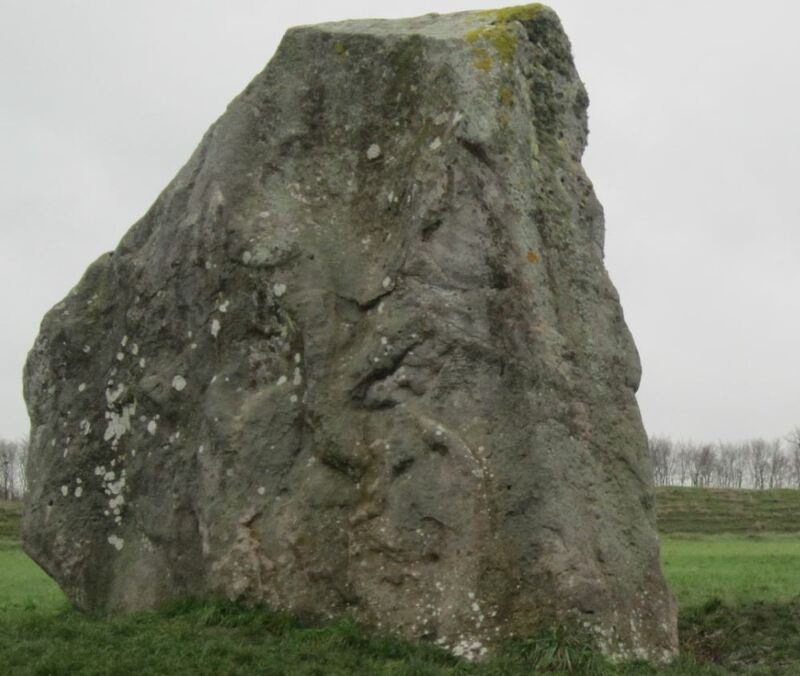 Below: A photograph of one of the stones in The Cove at Avebury stone circles in Wiltshire on which to the lower right hand side, can be seen the image of a hare. 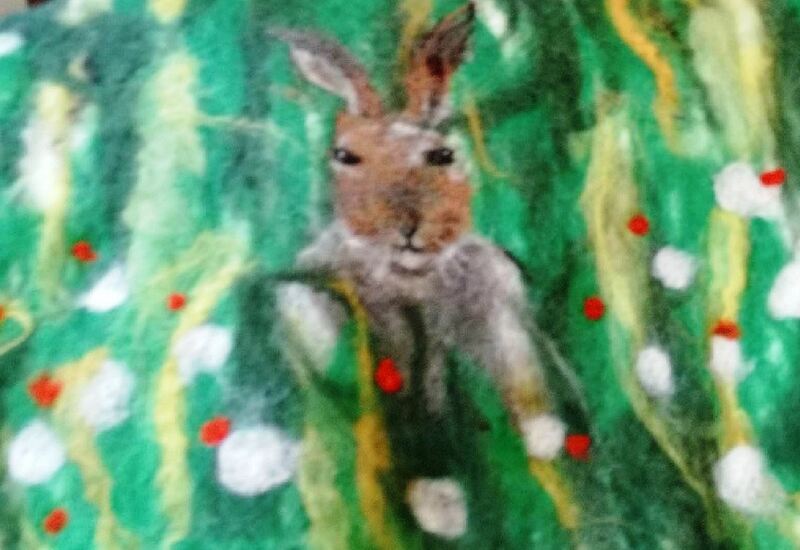 Thank you to Wesley Smith of Wesverines Prehistoric Sites for use of the lead image above, a photograph of a hare in the Avebury landscape in late winter 2016, and to Sophie Kinsley for the use of her felt hare collage photograph. Dedicated in loving memory to ‘Charlie’.